Me + Smitten Kitchen = GNOCCHI!!! SK’s recipe suggested that the pillows of potatoey joy be served in a tomato broth, but we’re avoiding acidic things like tomatoes for a bit, so I opted to make Chicken Soup instead. Sorta like an Italian -slash- Jewish theme going on. Gnocchi instead of Matza Balls or dumplings or whatever. So this morning I made the Gnocchi and the chicken soup, then this afternoon I prepped the Chicken and the Olive Oil roasted Shallots with French Sea Salt. Oh, and I made the chopped veggie salad from last night again – the one with the Maple Dijon Vinaigrette. There was much clapping in our house tonight. 1- Oven to 400°. Bake potatoes 45 minutes to an hour. 2- Let cool for 10 minutes, then peel (SK suggested using a knife or a peeler, I used my fingers). Either use a potato ricer or grate the potatoes on the large holes of a box grater (grated baked potatoes will fall apart). Cool them to lukewarm, about another 10 minutes, then add the egg and salt, mixing to combine. **I misread this and mixed the salt INTO the eggs. Ahh well. It worked. 3- Add 1/2 cup flour, and mix to combine. Add the next 1/2 cup flour, mixing again. Add 1/4 cup flour, and see if this is enough to form a dough that does not easily stick to your hands. If not, add the last 1/4 cup of flour, 1 tablespoon at a time, until the dough is soft but only a little sticky, and able to hold its shape enough to be rolled into a rope. Knead the dough together briefly, gently, on a counter, just for a minute. 4- Divide the dough into quarters. Roll each piece into a long rope, about 3/4-inch thick. Cut each rope into 3/4-inch lengths. At this point, you can use a floured fork or a gnocchi board to give each piece the traditional ridges. **To be honest, I tried – I totally tried to use the back of the fork method. I tried rolling them down the back of the fork, just like in all those stupid YouTube videos. Couldn’t make it look right and gave up. 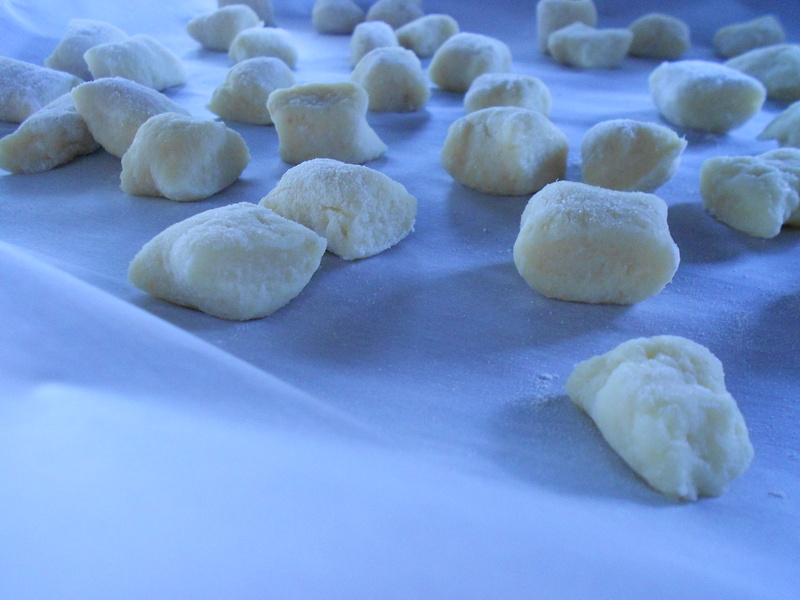 5- Place the gnocchi on a a parchment-lined tray. 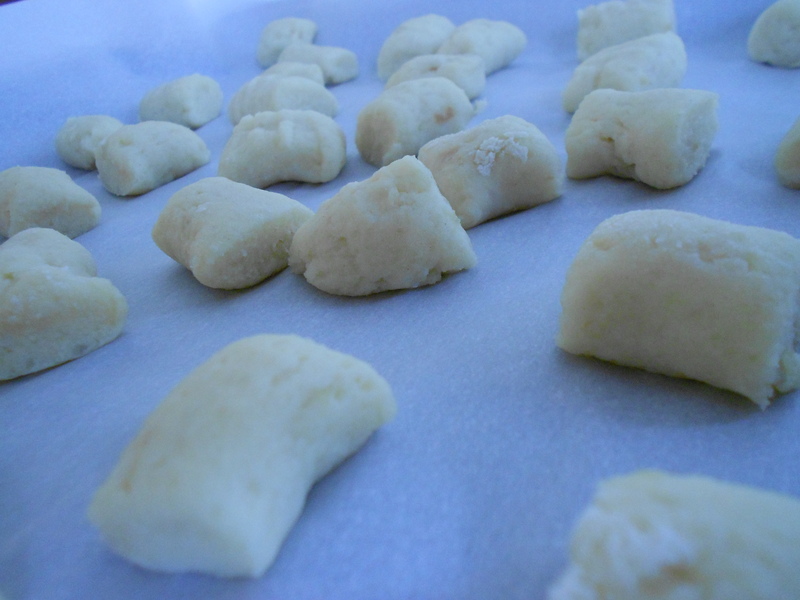 [Do ahead: If you’d like to freeze gnocchi for later user, do so on this tray. Once they are frozen, drop them into a freezer bag until needed. No need to defrost before cooking them; it will just take a minute or two longer.] **Alternately, I just left the gnocchi on the baking sheet all day until I made them for dinner. Cooking the Gnocchi: Place the gnocchi, a quarter-batch at a time, into a pot of boiling well-salted water. 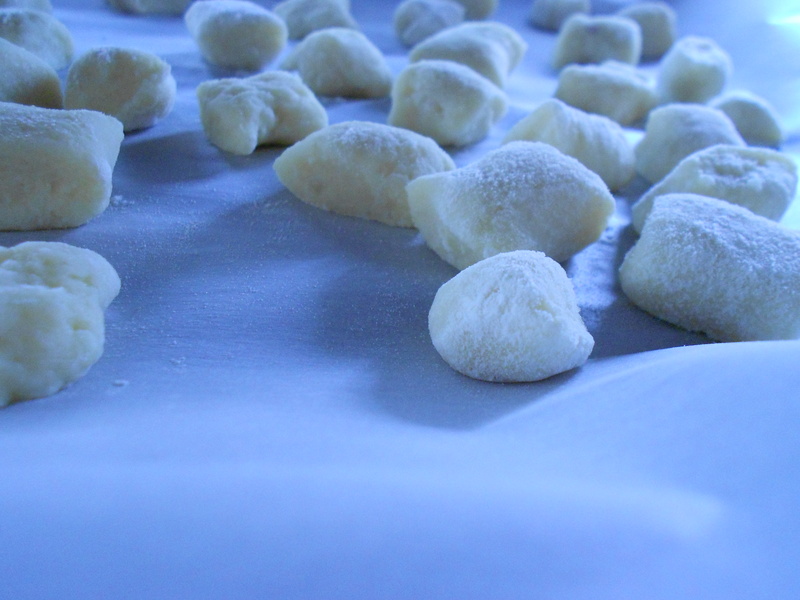 Cook the gnocchi until they float — about 2 minutes — then drain. **By drain, I took that to mean scoop out with a slotted spoon. Assemble dish: Meanwhile, reheat broth to a simmer. Add drained gnocchi then reheat through. Serve gnocchi and broth together. 3 Carrots, hacked into big chunks. Unpeeled. 3-5 Stalks of Celery (whatever you have in the fridge), hacked into chunks. 1 Onion, hacked into chunks. SKIN ON. 1 (mostly defrosted) Bone-in Chicken Breast **Feel free to use whatever bone-in chicken you have on hand. The bones are really what add the flavor in soups. 1- In your biggest soup pot dump all the veg – including the onion skins, carrot tops, etc. Add in the wine and the water. 2- Bring to a boil, then toss in the chicken and return to a boil. 3- Lower the heat to medium and let the soup simmer for about an hour or so. 4- Let the soup cool for 30 minutes or so, then strain into a big bowl. 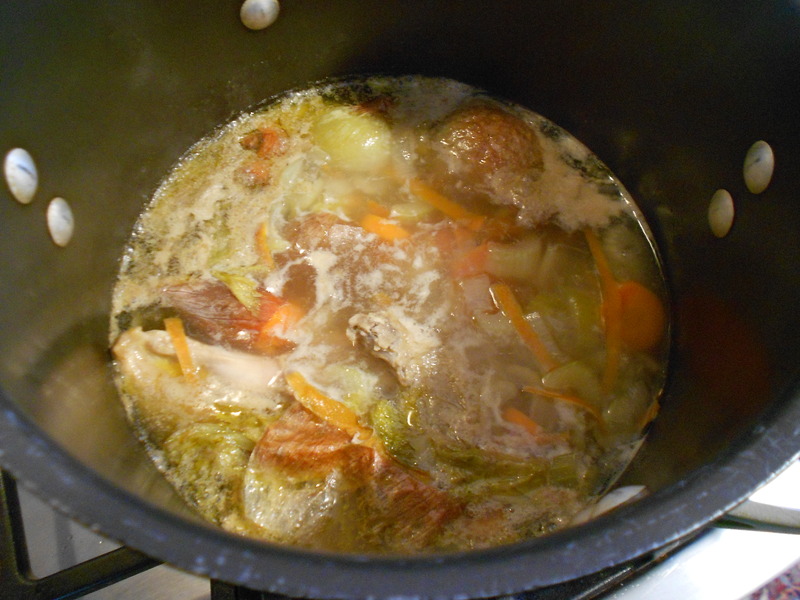 Discard the solids and strain again back into the soup pot. 5a- If you’re making the soup ahead of time …you’re better at planning than me. Whack that puppy into the fridge and after everything has cooled, skim the layer of fat off the top and discard it. About an hour before you’re planning on serving the soup you should let it come to room temp on the counter, then heat up slowly on the stovetop. 5b- If you’re making the soup for now, re-heat it slowly on the stovetop. 6- Ladle into bowls and try not to clap. You’ll spill. BTW – this freezes beautifully. We *all* need an up-close view of THIS! 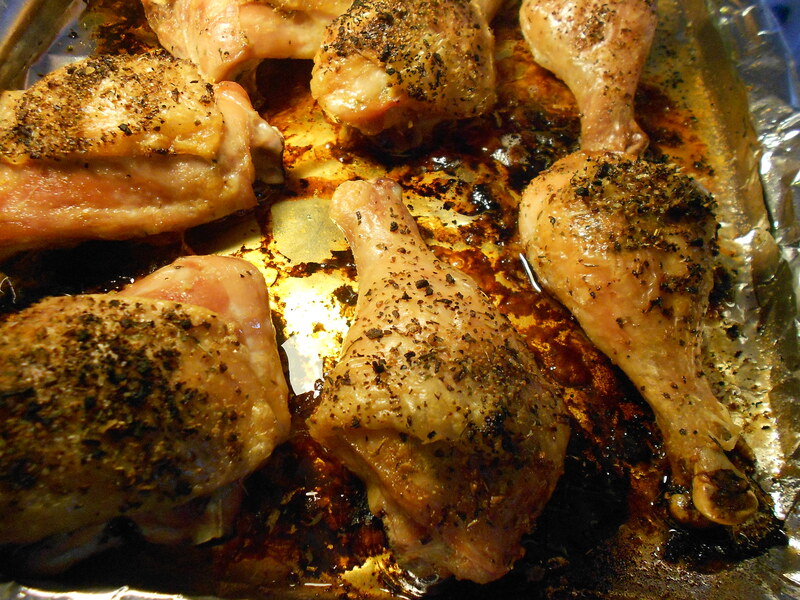 1 package of Chicken – I find this recipe works waaaaay better with skin on, regardless if you plan on eating the skin later or not. 1- Oven to 450° and rack moved to the top. 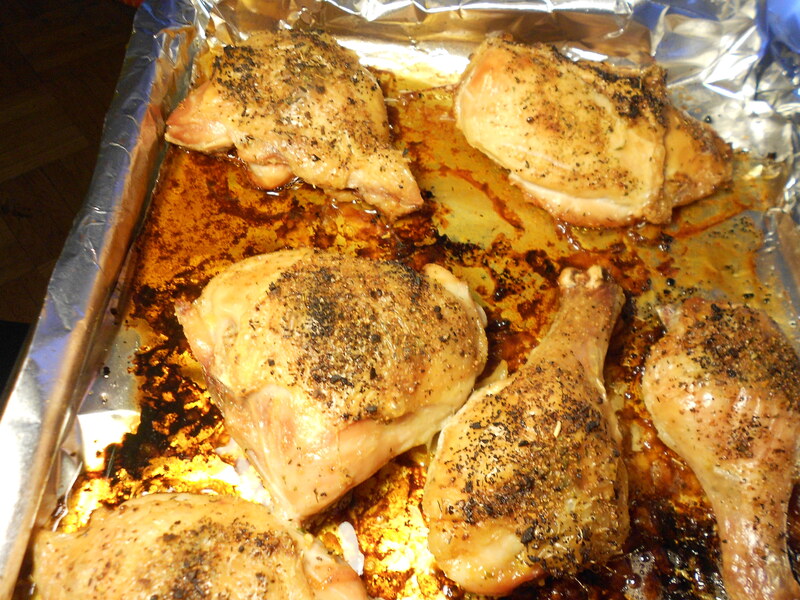 2- Line a baking sheet with one or two sheets of foil – you’ll have LOTS of shmaltz (rendered chicken fat) left over and this makes for super speedy clean up! 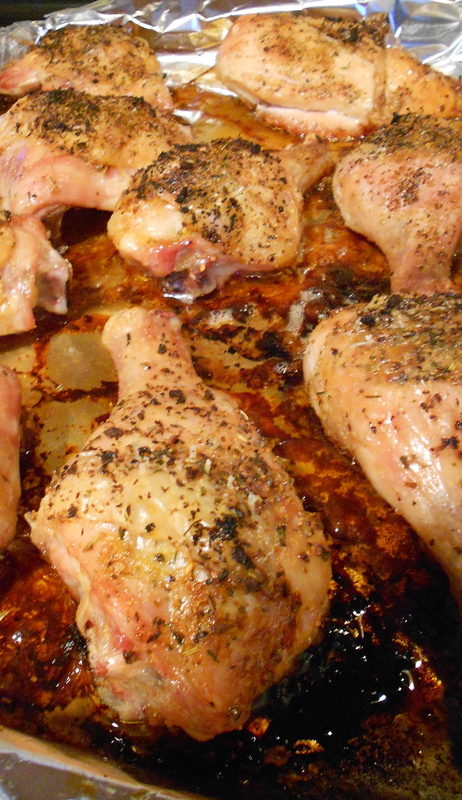 3- Lay out your chicken pieces on the baking sheet, skin side up. 4- Use your fingers to separate the skin from the meat a little bit – don’t detach, just make some room. You’ll sprinkle about 1/4 teaspoon or so of the Montreal Chicken Seasoning **BTW – I’m not getting paid by them or anything. This just happens to be an AWESOME spice blend. So you sprinkle some of the seasoning on the meat itself under the skin, then you lay the skin back and sprinkle another 1/4 teaspoon or so on top of the skin. Do this for all the pieces of the chicken. 5- Whack that pan into the oven for 1 whole hour. Try not to drool starting at about 40-45 minutes. The smell…… Aaaaah! 6- Let cool for 5 minutes or so, then serve to awaiting masses of people… aka your family! I couldn’t stop taking pictures – SO pretty! 1/2 lb of Shallots – feel free to use more or less, as you choose. 1 teaspoon good Balsamic Vinegar – Since this dish has so few ingredients, you should only use the good stuff. 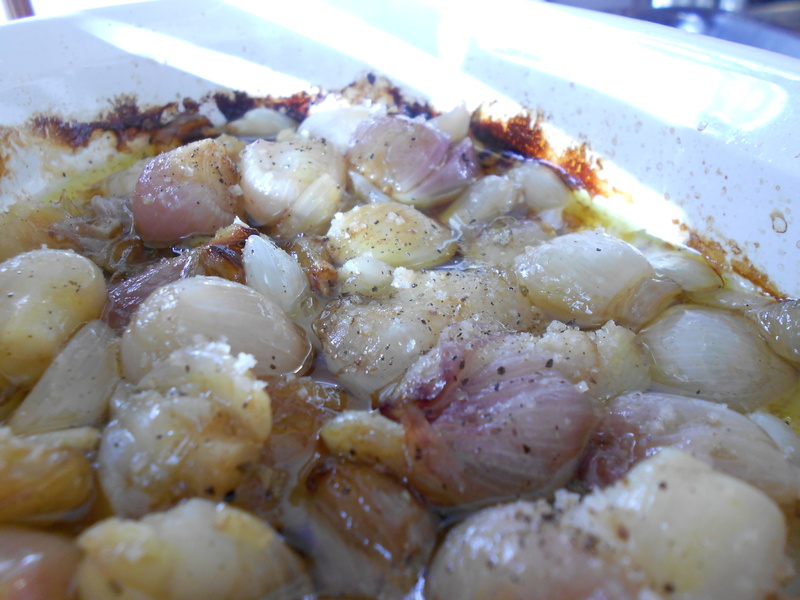 3- Place the cleaned shallots in a shallow dish and cover with the Olive Oil. Cover with foil and whack in the oven. 4- Come back in 30 minutes or so. Peel back the foil and taste a shallot to see if they’re done. If so, YAY! If not, re-foil and bake another 5 minutes or so. 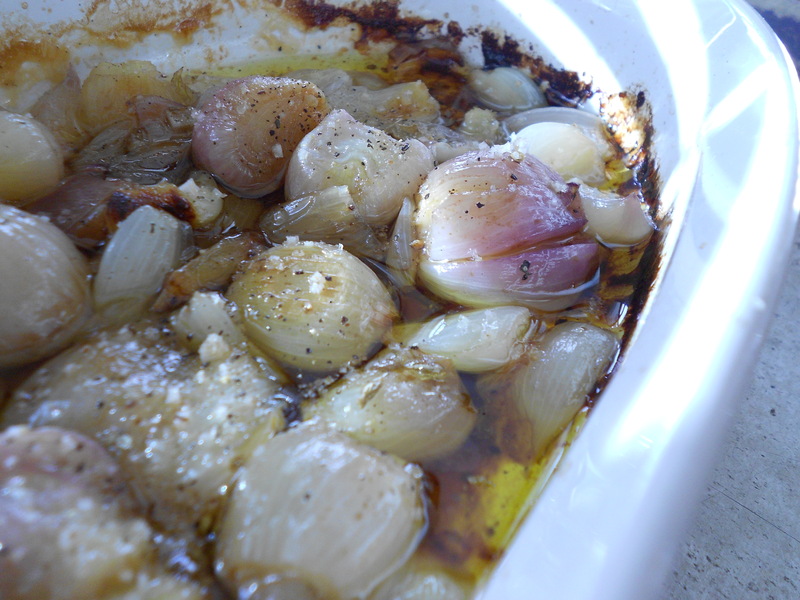 5- When the shallots are done, uncover and let cool just a minute. Stir in the Balsamic Vinegar then sprinkle the salt on top. End Results: C liked the shallots but thought I over-salted. Didn’t bother me – I devoured these. EVERYONE loved the chicken soup. C’s dad thought the gnocchi was ‘flabby’ but he was quickly and LOUDLY overruled by nearly everyone else at the table. The chicken was a HUGE hit too. The crispity crunchy skin, the tender meat… I had seconds. OH! and HOOORAY! I finally made gnocchi!!! YAYAYAYAYAYAY! Dinner was delicious! The Gnocchi was a success. I am very proud of you!